This past weekend I was visiting some friends in Ottawa. One of them is equally keen on fabric and we went on a little adventure. My husband came along to keep us company, figuring that there would be other shops to amuse him wherever we ended up. The truth turned out to be much funnier as you will see. The first place we looked for had 2 addresses according to google, but neither appeared to be correct. This was of course only discovered after much driving around along a torn up one-way street with detours. We found the 3 Tarts bakery instead and consoled ourselves with delicious cookies and brownies. Downtown, we discovered a fancy fabric boutique where prices like $150/metre were commonplace. Beautiful things, but a bit out of our price range. They did have something for me though. I found some bias-tape makers at last! I've previously only seen these nifty little gadgets online, so I bought two: a 1/2-inch one and a 1-inch one. I may end making my own quilt binding as a result. We also popped into a sari shop around the corner and petted the pretty silks, but couldn't think of any real excuse to buy anything. We then headed out to Orléans to find Quilty Pleasures, a quilting shop we'd learned of in the fancy-schmancy boutique. It turned out to be well worth the journey as it was filled with a lovely and extensive collection of cotton prints. But the two fabric nuts of the group didn't really find anything that suggested a project. And here's the funny part. 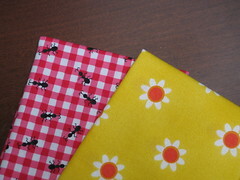 My husband found a red-gingham-with-ants print and thought it was perfect for a picnic, so I said I'd make him a picnic napkin/basket liner with it if he found another fabric he liked for the reverse. He picked a fun and cheery golden-yellow-with-orange-flower. He bought the two fat quarters and thusly was he inducted into the impulse-fabric-purchase club. So of the three of us, the only one NOT interested in fabrics and sewing was the only one who ended up buying any fabric. This is, without a doubt, one of *the* funniest stories about the 'fabric junkie club' that I've read in a long time! Does hubby know he is now famous in your fabric-nut circle?? Oh and btw, we need to plan a fabric trip to Japan. 'Dress-a-day' blog has reminded me of the unexplored marvels that await us! I only ever fabric-shopped in Hong Kong... and an Australian acquaintance says Tokyo is sublime for silk, too. I'm also an avid Dress a Day reader and fabric junkie! I've been eyeing the Japanese fabrics over on etsy and I love many of them.